May 25, 2017 – With all the buzz around Gov. Hickenlooper’s visit to the Grand Valley this past Saturday (taking the first shot at the Cameo Shooting Complex in Palisade, inaugurating Colorado Public Lands Day during the Grand Junction Off-Road, appearances at CMU and The Avalon Theatre…), you may have missed a small but significant event that took place right here at GJEP in the afternoon. After all, all the Governor did was approve a date change. But the date in question means a lot to those of us who work in economic development – and to the many businesses that want to expand or relocate to Colorado’s Grand Valley. Gov. 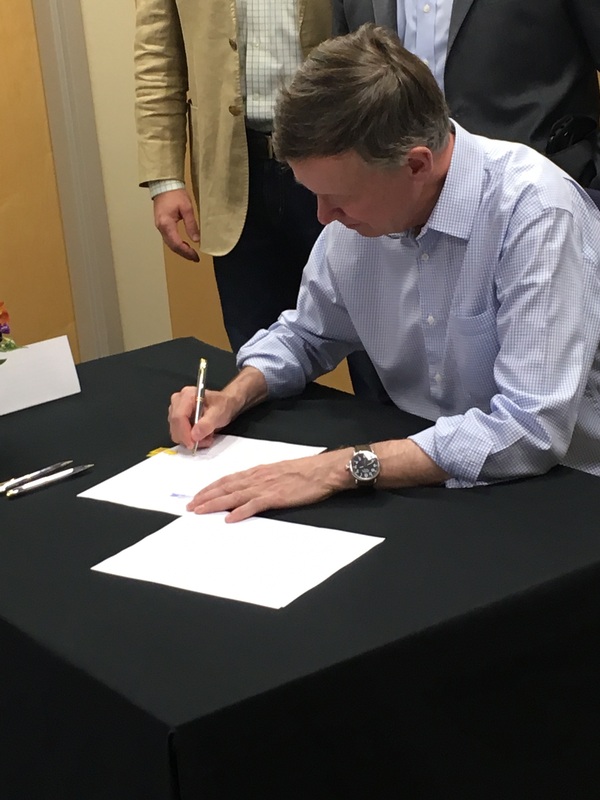 Hickenlooper signed Senate Bill 17-280 to extend the Colorado Economic Development Commission (EDC) from July 1, 2017 to July 1, 2025, allowing the Commission nearly another decade to promote economic development across the state. The EDC’s role is to provide loans and grants that allow Colorado businesses to grow. The organization oversees such important programs as the Rural Jump-Start Tax Credit program, Strategic Fund, Regional Tourism Act and Job Growth Incentive Tax program. The Commission is also responsible for policy decisions concerning the state Enterprise Zone Program. “The Economic Development Commission plays a significant role in growing and sustaining rural communities throughout Colorado,” said Rep. Thurlow, who along with Senator Tate and Rep. Tracy Kraft-Tharp, was a prime sponsor behind the bipartisan Bill. “In the last year, we have recruited eight new business endeavors in Mesa County, which together are projected to add over 600 new jobs and $25 million in new, annual salaries to the local economy by 2020. They are here because of the Rural Jump-Start tax credit, a program made possible by the EDC,” said Tim Fry, GJEP Chair and President of Mountain Racing Products in Grand Junction. For more information on the Commission, visit Choose Colorado’s website. For more information about incentives and grants available to businesses in Colorado’s Grand Valley, click here. Feature Photo: Shared excitement when Gov. Hickenlooper picks up the pen to sign Senate Bill 17-280 – from left to right: Jay Seaton, Daily Sentinel Publisher; Rep. Thurlow; Gov. Hickenlooper; Diane Schwenke, Executive Director of the Grand Junction Area Chamber of Commerce; and Tim Fry, MRP President/CEO and GJEP Chair of the Board of Directors. Inset: Gov. Hickenlooper signs Senate Bill 17-280 to extend the Colorado Economic Development Commission.